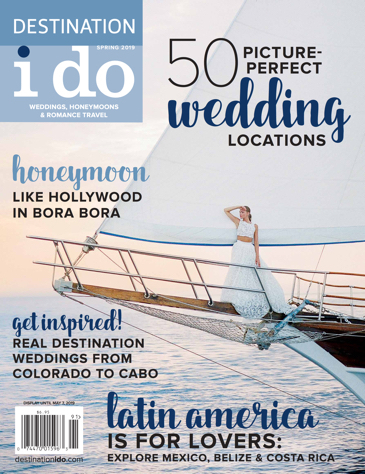 Want to be a published in Destination I Do Magazine? We, thankfully, get thousands of submissions a year for our blog and magazine, so please review the tips below for how to submit your real wedding, product or property for possible feature online or in our magazine. We look forward to seeing your submission and please keep in mind we get hundreds of submissions each month and we will get back to you as quickly as possible. Thanks for your interest in working with Destination I Do magazine! - Wedding must be a destination wedding for the bride and groom as well as the guests or it will not be considered. A destination wedding is classified as at least 120 miles from the couple’s current place of residence or roughly a three-hour drive. - Only professional photos will be accepted and a photo credit will be listed in return. If included on our blog or website, a link will be provided. - All photographers must sign a photography release form once the images are selected for print or online exposure. For our blog, we do require exclusivity for the images until six months after the date the wedding is featured. For print, we require total exclusivity. - Event must have taken place within the last calendar year to be considered. - If wedding is scheduled to run on a different wedding/travel blog, website or magazine, it cannot also be featured on Destination I Do’s blog, website or magazine. - 300dpi jpg images with an assortment of destination, bride/groom, detail and decor shots are suggested. Please provide a minimum of 30 images and a maximum of 100 images. If more than 100 images are sent, we will require the sender to narrow down the selections before we will review the submission. Please visit twobrightlights.com, we check this site regularly for real weddings submissions. Please send an online gallery or blog post with a maximum of 100 images to courtney@destinationidomag.com. Please do not send images as a ZIP file due to the time it takes us to download, open and review the images. - For a product to be featured in our magazine or on our blog, we must receive a sample for our review. We do not recommend or review any product without having seen it first-hand. If you wish to have the sample returned, please include a return shipping label in your package. With all the samples we receive, we are unable to cover the cost of return shipping. - If you are interested in Destination I Do Magazine possibly featuring your property in our print publication, please be aware we do not feature any property we have not visited personally. Please send all information on potential press visits to jennifer@destinationidomag.com.